You know how every movie that is about LA shows the same stuff in the first opening sequence: the Hollywood sign, the Walk of Fame, bikini-clad rollerbladers in Santa Monica, Rodeo Drive… Same for Paris with the Eiffel Tower, the Champs-Élysées, an outdoor café, the Arc de Triomphe. 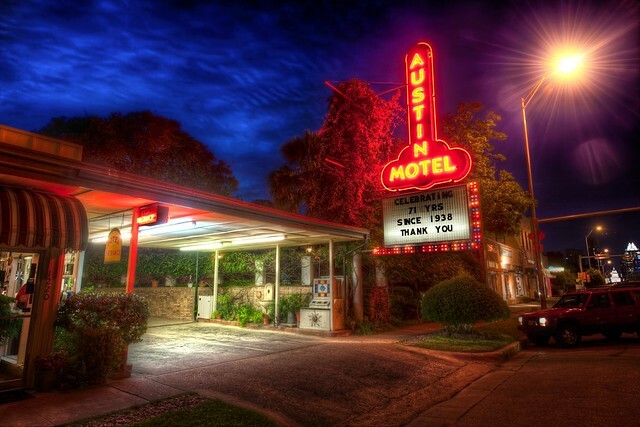 Here’s my attempt at a montage opening sequence for Austin, a city known for its weirdness. It can also be a game for you: see if you can find all of them within a month of moving here! 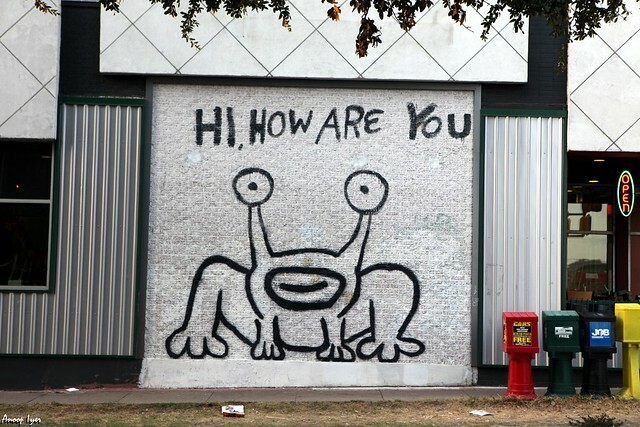 Musician Daniel Johnston’s mural at the corner of 20th St. and Guadalupe. It’s been graffiti’d over many times and luckily they’ve always been able to restore it. 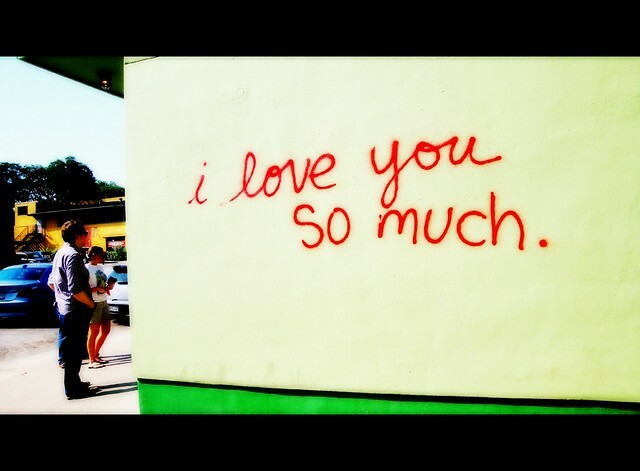 This is down the street from our old house on Duval St, so I know it well. 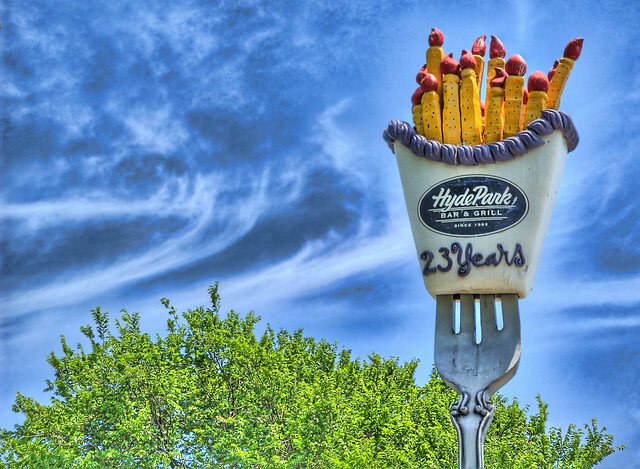 The restaurant changes the item on the fork frequently and has been a heart, a UT longhorn symbol, and fries (shown here), which they are known for. A diner about a mile from my house where Janis Joplin got her start singing. Can’t you just see the soul emanating? Darn good cobbler, too. 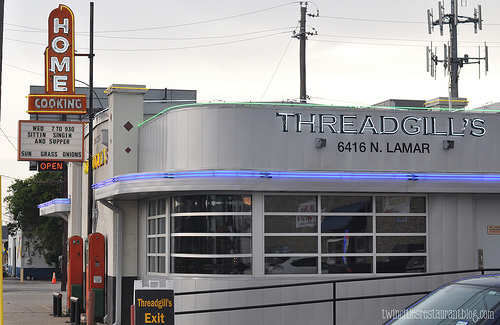 Located on North Lamar. 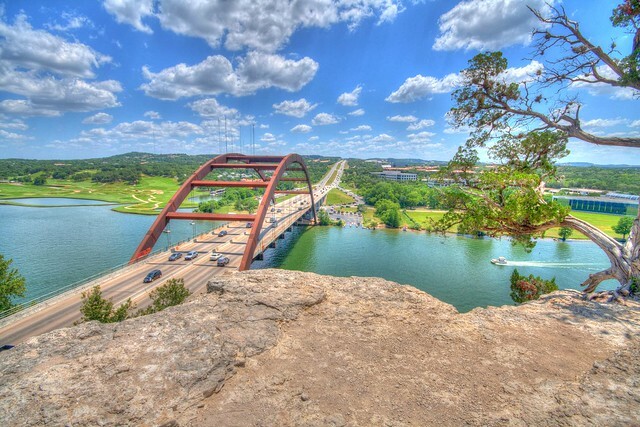 When we first moved here we lived in Hyde Park, which is one of Austin’s oldest neighborhoods. There was this one house that had this gigantic tower in their front yard, and we thought it so odd that they’d want cell phone service so bad. Turns out they were historical structures, built in Austin back in the 1890’s to provide light at night. People were a little freaked out and thought that the produce would grow all night under the artificial light. There are 15 remaining today, and are fun to spot around town. There’s not much to say about this sign except for that I love seeing it. It’s on South Congress. Wanna find my kids’ daycare? Hang a right at the arm. The battiest bridge in America! 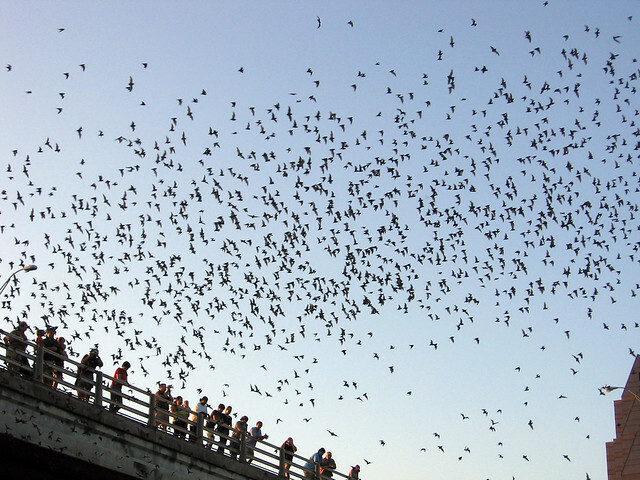 Come out from March to October to see the bats fly out from under the bridge at dusk and go after all those nasty mosquitos. It’s the most impressive around August and September when their population is at its highest. If I leave this off the list someone will write and complain, so here it is. Dear lord, people, enough HDR photos of this thing! We get it already! Back when Texas was an independent nation, Mr. Sam Houston, el Presidente, wanted to move the capital to … Houston. Now why do you suppose he’d want to do that? He tried all the governmental tricks to do this and failed, and as a last resort sent a team to Austin to steal the government archives. 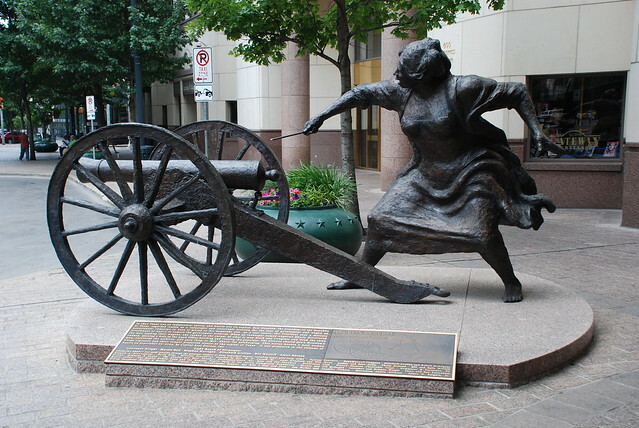 Luckily our heroine, an innkeeper named Angelina Eberly, found them loading the goods and ran to the town cannon located at 6th and Congress to sound the alarm (which is a metaphor, because it really just blew a hole in the Land office and caused a big ruckus). Austinites chased down the sneaky Houstonians, took back the governmental archives, and Austin retained its status as Capital of Texas. Here’s to Angelina Eberly! You can pay homage to her at 6th and Congress. Lots of people here worship Stevie Ray Vaughn. I don’t happen to be one of them, but I know a dude who worked on this sculpture and he’s pretty far out, so every time I see this, I think of my buddy Jeff. For those of us not blessed with a live oak in our backyard, we can visit the one behind Central Market on North Lamar. My kids, husband and I all equally love climbing on it, especially on a Friday night when there’s a band playing in the background at CM. 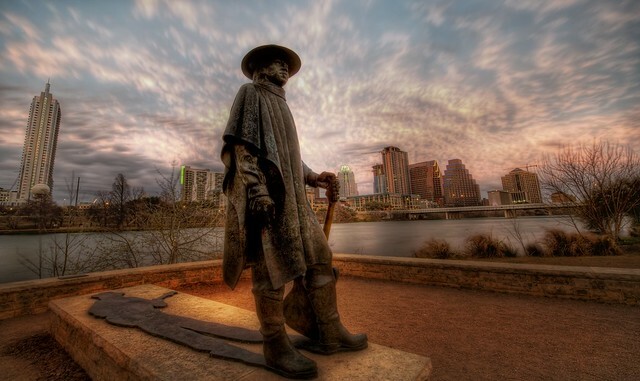 Austin’s most famous homeless person, sadly passed away in 2012. He may not be around anymore, but his spirit lingers. Many thanks to people on flickr for the visual references (please click on each photo for the source).